2013 was a significant year for the Windows Phone platform. According to IDC Worldwide Quarterly Mobile Phone Tracker, Windows Phone had the largest year-over-year growth of the leading smartphone operating systems in 2013 to become the #3 smartphone operating system globally and the #2 smartphone operating system in several emerging markets. Increasing developer monetization is a key priority and an area where we’ll invest to drive greater revenue opportunity for the community. To maximize this opportunity in markets where credit card use is low, we are committed to enabling users to pay for apps via local and trusted payment methods such as carrier billing and gift cards. Last year we tripled our carrier billing connections to 53 carriers across 33 markets and launched Microsoft gift cards with 100 retailers in 41 markets and we are committed to expanding this footprint in 2014. In our experience, carrier billing minimizes consumer purchase barriers, particularly in emerging markets, where we see an average 6x increase in paid transactions after we launch carrier building. For example, we have seen outstanding paid transaction increases following carrier billing launch in markets such as Mexico and Indonesia. For some key emerging markets, there are higher costs to enable alternative payment methods such as carrier billing. To access the monetization opportunity in these markets with low credit card usage and higher costs, we are introducing a Commerce Expansion Adjustment to Application and In-App Product sales. The Commerce Expansion Adjustment is an additional percentage on top of the normal Store Fee (percentage of Net Receipts) that is deducted in calculating the Application Proceeds payable for Application or In-App Product transactions using specific payment methods in a limited number of countries/regions. Details about how the Commerce Expansion Adjustment is calculated and deducted from Application Proceeds can be found in the App Provider Agreement. The Commerce Expansion Adjustment will take effect for the specified countries/regions in March 2014 at a rate of 13.9%. Additional countries/regions and payment methods may be added over time as we expand carrier billing and other alternative payment methods into new markets. The markets and payment methods for which the Commerce Expansion Adjustment applies will be updated monthly on MSDN with new markets and payment methods appearing within thirty (30) days after the Commerce Expansion Adjustment takes effect for a country/region and payment method. 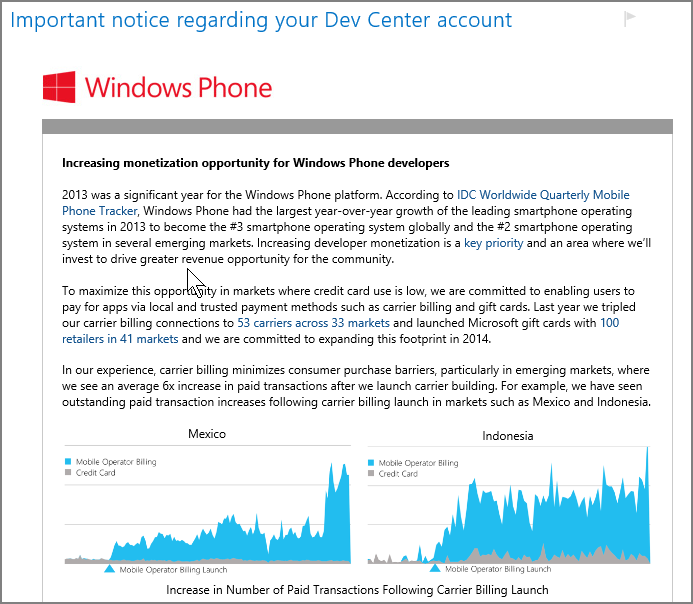 With Windows Phone Dev Center you can choose in which markets you publish your apps and how you price them in each market. In doing so, you may want to consider if the Commerce Expansion Adjustment applies in a specific market and factor that into your market pricing strategy. For further details about the Commerce Expansion Adjustment and the list of markets where it applies see your App Provider Agreement and MSDN. Via this effort, Microsoft is hoping Devs will get pumped for their platform and get rewarded for their efforts. Let us know what you think of this in the comments below. Next Next post: Several Paid Disney Games Free For a Limited Time on the Windows Store! Reblogged this on Curiosidades na internet.